HPLIP, HP Linux Imaging and Printing released v3.13.11 with many new HP printers and Debian 7.2/6.0.8 support. Here’s how to install it in Ubuntu 13.10, Ubuntu 13.04, Ubuntu 12.04, Linux Mint. 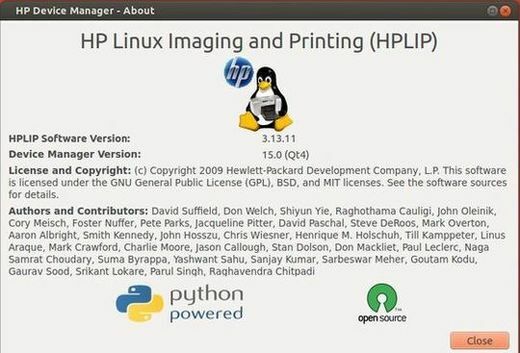 As you may know, HPLIP is an HP developed solution for printing, scanning, and faxing with HP inkjet and laser based printers in Linux. The HPLIP project provides printing support for over 2,080 printer models–including; Deskjet, Officejet, Photosmart, PSC (Print, Scan, Copy), Business Inkjet, LaserJet, Edgeline MFP, and LaserJet MFP. Also added supported for Debian 7.2, Debian 6.0.8, and added Pin Printing support for HP LaserJet m5035 MFP device. Finally start the installing process and follow the prompts. It will automatically install this tool and configure your connected HP printers.